The kids are back at school and the summer of 2015 is drawing to a close. But before we start lighting the fires and getting out the coats, I wanted to remind you of our fabulous fete back in July and say a big THANK YOU for all that you did to make it such an overwhelming success. The weather was kind to us again and it was wonderful to see so many people on the Green having fun with their neighbours. From Splat the Rat to Welly-Wanging , from the Nerf gun target range to egg throwing, from skittles to the human fruit machine there was plenty of entertainment for all. We are grateful to Mullenscote Gundogs and the Hawk Conservancy for their wonderful displays, and, of course the children of Amport School for their fantastic country dancing. The brave made their way over to join Tony Darbyshire and his team climbing the highest tree on the Green, whereas there was an altogether more relaxed atmosphere in the tea tent! 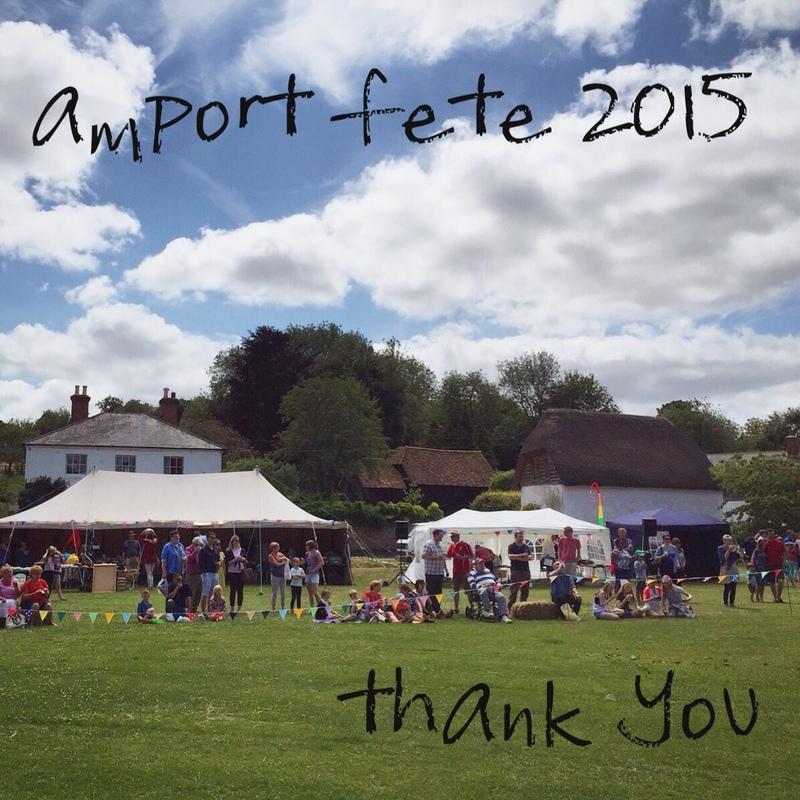 Thanks to all villagers that baked, crafted, grew, painted, manned stalls, put up tents and contributed in any way. Our supper on the Green was bigger and better than ever, with Re:play providing the soundtrack and Neil Warren and his bar staff keeping spirits high (and glasses topped up!). The auction was truly amazing and huge thanks go to our fantastic auctioneer Andrew Bulpitt, our generous bidders and all donors for their incredible auction prizes, a special mention must go to Ben Upjohn for his generosity. It takes a lot of work to pull together the day, and we are truly grateful for all help that we receive. The 2015 fete and supper has raised over £15k for local charities; our churches, our school and local community projects. The funds are much needed and greatly appreciated. Amport church will be using the funds raised to help with their repair programme and to contribute to their appeal for improved heating. The school is raising funds to put in a new kitchen, and the community charity have a number of projects in the pipeline, including a village defibrillator – watch this space. This entry was posted in amcc, Church, Events, News.